Toyota started the production of its first in the history V8 diesel engine in 2007. The 1VD is a 4.5-liter V8 diesel engine with a single turbocharger or twin turbochargers depends on a vehicle model (Toyota Land Cruiser 200 and Lexus LX450d, 70-Series LandCruiser). 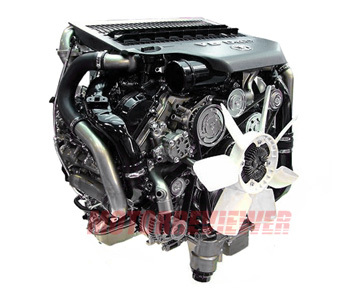 The new turbodiesel replaced the previous Toyota's diesel power unit - the 1HD-FTE engine. The 1VD-FTV cylinder block is made from nodular graphite cast iron. It has a 90-degree V shape, and cylinder banks have a 22.0 mm offset. There is a forged steel crankshaft with seven balance weights on five journals inside the engine block. The bottom end also includes the high-strength steel connecting rods and aluminum alloy pistons with combustion chambers in the piston crown. The 1VD cylinder block has oil jets at the bottom of the cylinder bores which spraying engine oil on the underside of the pistons for better cooling and lubrication. The cylinder heads are made from aluminum alloy. Each head has intake and exhaust camshafts (DOHC), 16-valve or 4 valves per cylinder (32 valves total). The engine uses the combination of a cam gear and timing chain for camshafts rotation. The intake camshafts are driven by a timing chain, while the exhaust camshafts are driven by a gear attached to the intake camshaft. The intake duration is 199 degrees, and exhaust duration is 233 degrees. Roller rocker arms actuate the valves. The valvetrain is equipped with the hydraulic tappets/lash adjusters which allow maintaining the required clearance between the rocker arm and valve stem. The intake valve diameter is a 30.1 mm; the exhaust valve diameter is a 27.0 mm. The valve stem diameter of the intake and exhaust valve is the identical – 6 mm. The twin-turbocharger versions for the 200-Series LandCruiser are equipped with two low-inertia RHV4 turbochargers (IHI VB36 and VB37). The version for the 70-Series LandCruiser has a single turbocharger Garrett GTA2359V. The 1VD-FTV comes with an air-to-air intercooler which is mounted on top of the engine. The fuel system is modern. There is common rail D-4D direct injection, nine-hole fuel injectors, and Denso HP4 type fuel supply pump. Of course, the engine has the glow plugs (they are located between the intake valves). Achieving high emission standards, engineers equipped the engine with the water-cooled Exhaust Gas Recirculation (EGR) system and an oxidation catalytic converter. Vehicles with the 1VD-FTV engine for some markets have the diesel particulate filter (DPF). There are not many issues and common problems with the 1VD engine. It has durable and reliable cast iron cylinder block. Early engines (until 2010) have a potential issue with high oil consumption. The reason for that is a failed vacuum pump. The updated version of the vacuum pump never caused any problems. The engine doesn't like prolonged operation at high revs. Try to avoid such driving modes. Like a modern engine, the 1VD-FTV requires the high-quality engine oil and fuel. The fuel filter is very sensitive, and a bad fuel will destroy it after a few thousand miles. With proper maintenance and qualitative oil and fuel, the engine life of the 1VD engine is about 250,000-300,000 miles. The 1VD-FTV longevity is only slightly inferior to its predecessors.